Is there anything weirder than a childless 34-year-old watching a program designed to ease pre-schoolers into the world of toilet training? Well, yeah � there are lot of spooky things out there! Still, never did I think I�d find myself screening such a show. However, that�s exactly what I did. Potty Time With Bear arrived on my doorstep and I figured I�d give it a look. While I clearly don�t fall into the series� intended audience, I found my prior experience with the show � Party Time With Bear - to be a reasonably entertaining experience, so I didn�t object to a little more time in the Big Blue House. Each episode of the series follows a pretty standard format. 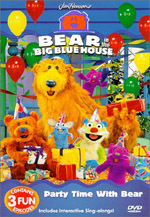 At the very start of the program, we enter the Big Blue House and meet our host Bear (voiced by Noel McNeal). He tells us how we smell � in a more pleasant way than one might fear � and enter the show�s theme. At some point, we almost always see an encounter between Bear and Shadow (voiced by Tara Mooney), and the episodes always end with a chat between Bear and Luna (Lynne Thigpen), the moon, who settle us down for the evening. 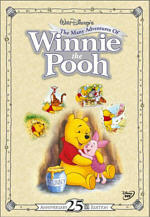 Despite the title of the DVD, only one of the episodes deals with toilet habits. In �When You've Got To Go�, Tutter the mouse (Peter Linz) has some potty-related anxieties, so it�s up to Bear to help guide him through the process and understand the ways of the world. Despite the iffy subject matter, the show handles it gently and with taste. The other episodes don�t stick with a central focus, though I suppose there�s a loose theme of �growing up� to be found in the three shows. When we move to �If At First You Don't Succeed�, the emphasis moves to learning that not everything comes easily. Ojo (Vicki Eibner) wants to be a big bear, and Bear helps her realize that it takes time and practice to get better at activities. Finally, we find �Call It A Day�. This one offers a more generic focus as we go to the end of the day. Bear looks back on all of its events. The program doesn�t provide a general theme as much as the others; it just shows us all of the fun Bear and the gang encountered. While I clearly don�t fall in the target audience, to my small surprise, Bear is actually a decently entertaining program for adults. Don't take that as an endorsement that anyone over eight or so will want to plop down and spend an hour or so with Bear and his friends, because it's not something I'd choose to watch for its own merits. However, it does appear much more fun and charming for all audiences than I'd expect, so don't freak if your kids want you to watch it with them. Because my childhood days are long gone, I can't really estimate Bear's appeal to that crowd, but I'd guess it should play well. The characters are sweet and friendly and all offer distinctive and gently witty personalities, and the shows encompass a small scope but keep the pace moving at an acceptably quick pace. All three shows are pleasant and charming. Although the proceedings remain low-key for the most part, they provide some fun and laughs for kids throughout the program. The scripts are relatively clever and even though the songs are very derivative, they still have some bounce and spark. (Is it just me, or do Pip and Pop sound a lot like the Beastie Boys when they do their hula-hoop rap during �If At First�?) Will I ever watch Bear again? Not a chance, but if I had kids, I'd be more than happy to let them view the show; it seems like a very well produced children's program. Sign of the times: about 30 years ago, All In the Family shocked audiences when it featured the sound of a flushing toilet. Now we find a childrens� program in which we watch a little blue mouse take a dump. Is that progress? 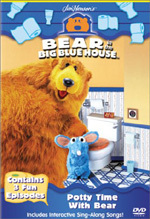 Bear in the Big Blue House: Potty Time With Bear appears in an aspect ratio of 1.33:1 on this single-sided, single-layered DVD; due to those dimensions, the image has not been enhanced for 16X9 televisions. 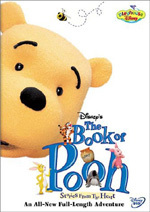 Of the three Bear DVDs I�ve seen, Potty Time was the most attractive by a modest margin. Sharpness seemed consistently fine throughout the program, with very little softness on display. The picture consistently remained crisp and distinct with no decided problems. Moir� effects appeared to a minor degree, but jagged edges were not a significant concern. The videotaped program showed no noticeable source flaws, as it looked consistently clean and fresh. Colors were a strong point of this DVD. As one might expect from a kids' show, hues were bold and brilliant, and they looked quite nice at all times. The nature of the original videotape source kept them from appearing truly terrific, but I found them to be very solid. Black levels came across as reasonably deep and distinct, while shadow detail looked clear and appropriately opaque. Overall, this was a fine presentation that accurately displayed the source material. The stereo soundtrack of Bear was decent but fairly unambitious. Most of the audio seemed to be essentially monaural, with almost all dialogue and effects emanating from the center channel. Music spread nicely to the side speakers but still remained pretty centered much of the time. Quality seemed fine adequate. Speech appeared warm and relatively natural speech; I heard no concerns related to edginess or intelligibility. Effects sounded nicely clean and distinct, with no problems in regard to distortion; they were a minor aspect of the mix, but they seemed adequate. Music showed nicely broad and lively tones, and the score and songs boasted some fairly solid bass response at times. I was surprised that the DVD didn't include at least a Dolby Surround mix, but the existing track appeared fine for the program. �Your Potty Chair�, �The Toileteers�, �Hello Song� and �What�s That Smell?� These take the scenes from the show and superimpose large, kid-friendly lyrics that fans can follow. On its own, Bear in the Big Blue House: Potty Time With Bear doesn't hold much appeal for adults, but it seems like a fun program for kids, and adults who want to watch along with their little ones will probably find the experience to be enjoyable. Picture and sound are both very good, but the DVD lacks substantial extras. Nonetheless, Bear is a good choice for younger viewers or older ones who still poop their pants.